​A Word Sort is a simple individual or small group activity. Students list key words from a reading selection. (Alternatively, the teacher may provide a list of terms prior to the reading activity.) Students identify the meaning and properties of each word and then "sort" the list into collections of words with similar features. This "sorting" process links students' prior knowledge to the basic vocabulary of a reading selection (Reading Educator, 2015). In this video above, students are participating in a Word Sort. They have been working on blending at beginning and end of words. Here in particular the kids are practicing with consonants that are silent. Showing that two consonants at the begging of the word don't always have their own sound so the first letter is silent. For example, knot. First the students pull the patterns of the words out on their own. After that with the teacher they talk about what patterns they saw and what sounds each pattern made. List between 10 and 20 key vocabulary words from a reading selection on the smartboard or on index cards. Conduct a class discussion with each group presenting their word list for one of the categories. Require the students to defend their sorting of terms by asking about the common features of the categories and how each specific word meets these criteria (Readstrong, 2011). When working with math vocabulary, especially in the younger grades word sorts can be a great tool. The example "word sort math lesson" below shows that you can use a sort to place terms in rows or columns according to the meaning of each term. For example, if you had two list titles "addition" and "subtraction, " students could sort a list of math terms into the category they see best fit. A science word sort can be similar to math because again words can be separated into groups they belong. The science lesson plan below also deals with language arts because they are working with specific vocabulary words. In this lesson the words are being sorted into solid, liquid, and gas. Reading rockets also gives an example of a plant word sort. First students make a list of plant words and then place them into groups such as types of plants, parts of plants, where plants grow, and what plants need to grow (Reading Rockets, 2015). Social Studies can also can be a sorting area because of the numerous terms that are used. Things such as past, future, present are areas where students could sort terms into when important events had happened. This would be more common for higher level grades but could be modified to help younger students. Putting areas of transportation into groups or simply creating lists of transportation words would be a great example (Reading Rockets, 2015). Reading is going to be the most common form of word sorts you will see because this is the area they were first created for. Students can place specific words into different categories based on each word's meaning. Categories can be defined by the teacher or by the students. When used before reading, concept sorts provide an opportunity for a teacher to see what his or her students already know about the given content. When used after reading, teachers can assess their students' understanding of the concepts presented (Reading Rockets, 2015). Word Sorts can be used for a variety of different topics and can be helpful for all students. "Some benefits of word sorting are that it's interactive, it promotes higher level thinking skills, and it provides oral language development opportunities that build on students' prior knowledge (Pearson Education, 2010). The video to the left stated that before starting word sort the students were given a spelling inventory to decide groups they should be placed in and to decide which spelling patterns they need to work on. 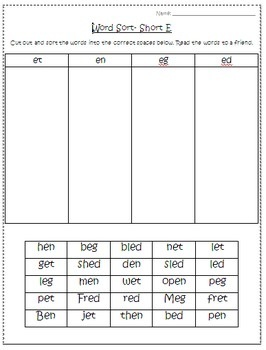 Teachers can tailor word sorts for individual children, depending on student needs or the activity can be completely student-centered. For example, if a child has difficulty distinguishing between long and short vowel sounds, an adult may assemble a group of words that the child already knows and ask him or her to sort them into categories. For extra support, the cards could include a picture that goes along with the word (pictures could be helpful for English Language Learners). The same group of words could later be used to sort by initial consonants, number of syllables, or any other relevant word characteristics (Readstrong, 2011). This video shows the different ways word sorts can be completed using the same list of words. For example you sort, speed sort, pattern sort, and more. Take a look in the video below. Teachers may wish to have students write the completed sorts to help solidify learning. Have students work in pairs or in small groups. Provide students with the category headers and ask students to sort only the examples. Provide extra blank blocks for students to fill in their own examples. Use pictures along with the words. For example, a picture could be provided for each of the words in the Math example above. Be aware of cognitive and cultural diversity as you evaluate how students sort the cards. Words on the card should be printed clearly so they are easily readable by all students. Large letters and contrast between the letters and the background are helpful (Reading Rockets, 2015).